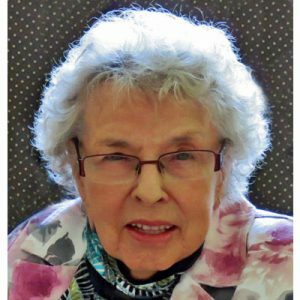 Alice – Age 93 of Kelowna, BC, passed away peacefully on 10th of September 2018. Born in Rossburn, Manitoba, she was the daughter of the late Onofrey and Anna Belinsky. In 1944, she married John Dolinski and moved to Shilo, Manitoba where he served in the Army’s 1st Parachute Battalion. Since then, they were posted to many locations in Canada and Germany. John retired from the Army in 1970, settling in West Kelowna. Alice, a loving mother, enjoyed cooking and having her family around. She also enjoyed looking after her dogs and working in her garden. She is survived by her brother Nick; daughters Joan and Linda (Richard); grandchildren Sharon (Chris) and Craig (Keri); great grandchildren Cyrille and Samantha (Andrew) and great, great granddaughter Genevieve. She was predeceased by her husband John; son Donald; brothers, Walter, Bill and Jack; and sisters, Stella, Lena, Mary and Margaret. If friends so desire, in lieu of flowers, they may make tributes to the Society for the Prevention of Cruelty to Animals, www.spca.bc.ca. Alice’s family would like to extend gratitude to the extraordinary and loving care provided by the Cottonwoods staff as well as Belinda Johnston and her crew of TLC over the last several years. Thanks also goes out to her good friend, Paul Fehr. At her request, a private family service will be held at a later date. If friends so desire, in lieu of flowers, they may make tributes to the Society for the Prevention of Cruelty to Animals, www.spca.bc.ca. The service for DOLINSKI, Alice is scheduled for A private family service will be held at a later date.. Below you will find the map for the service location and the contact information should you have any questions.